I assume these nests are part of a Black-crowned Night-Heron rookery because those buggers were everywhere! And they are not like the Night-Herons I am familiar with. These losers beg for bread crumbs with lowly pigeons! PIGEONS!!! But yeah, it was pretty cool to see them up close without bothering them. But GAWD, they were friends with PIGEONS! They lost soooo many cool kid points that day. Coots were abundant too, and my friend's 3-year-old can actually ID them so that's fun. My friend pointed out this coot lacking the red spot on its frontal shield. It reminded me of a coot that was seen in Vancouver awhile back. The lake itself holds lots of nice ducks sitting pretty for photos bread crumbs. There were piles of scaup (most likely holding the TUDU underwater for my visit) scattered with Canvasbacks, Common Goldeneyes, Ruddy Ducks, and others. I also now understand why Seagull Steve has so many good bellowing duck photos. The lake had its share of gulls too- most, if not all, of which were also lowly bread-crumb-beggars. While walking the main path I heard a couple of hummingbirds making a racket. I watched as they both flew down to the grass and was able to see them laying with their wings spread facing each other. What does this mean? It didn't last long and they flew out of sight quickly. I started to move away from the lake and into the trees. I heard a sound I could not place and saw a large-ish bird moving around in a tree across the lawn. I followed the sound but kept losing sight of the bird. Finally I was able to confirm it was a Nuttall's Woodpecker! There were actually two of them chasing each other around making me feel insane as I followed from tree to tree, always two steps behind. I managed a second life bird after rejoining my friend and her son post-Fairyland. It was an Oak Titmouse, a bird I had not even realized I should be looking for there. My friend referred to it as the most boring-looking bird ever. Indeed, it lacks pizzazz. Another fairly simple bird at the park (though definitely brimming with pizzazz) was the American White Pelican. There were two resting near the heron/pigeon/gull havoc. Shame on you beggars!! Go murder some voles!! Ok, anyway, it was a fun place to spend a few hours. Good times! Sorry! Now you need to show me trogons eating out of a trash can or something. Cool! Good birds all around! Looks like you had a really nice mix of Greater and Lesser Scaup. What a photo opp. Seriously- the first time they ever looked so distinct to me. 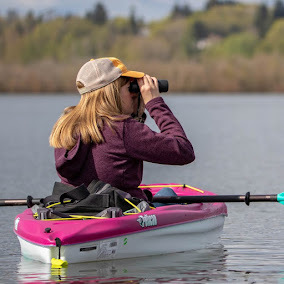 Great birds and sightings, Jen! I have never seen heron and egrets begging for crumbs. Neat seeing the hummer, that is new to me too. Congrats on your new birds, the woodie and titmouse are wonderful. Great photos, happy birding! So many cool birds I don't even know where to start my comments. But first off, how can you be friends with someone who thinks the Oak Titmouse is the most boring looking bird ever? (kidding of course). Those night herons are crazy! I wonder why the behavior is so different in other regions. And I really hope you weren't feeding the birds bread crumbs. I don't want to be a purist, but cracked corn would be better. Such cool birds in this post!!! 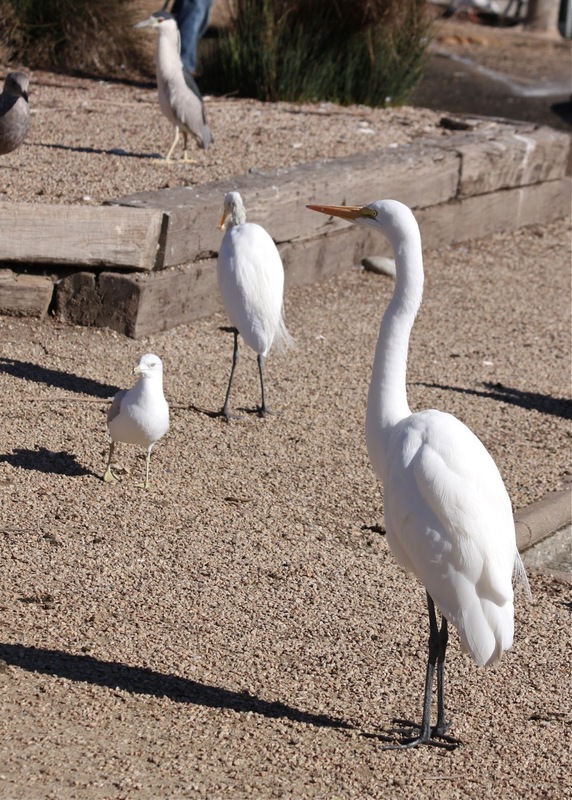 I've seen a few begging Egrets before, but a BCNH...that is pretty shocking! Maybe I'll try to lure one of reeds at the wetlands with a slice of bread...JUST Kidding! ok, so its not a "birding" shot but that last picture is lovely. Great composition. I grew up going to Fairyland and rowed crew on Lake Merritt. So sad I wasn't a birdnerd then! Thanks for the pretty pix of home! The night herons are amazing down there. Oh, I like oak titm, h, titmice? I like their spiky hat, very stylish, but, yes, understated style. Bushtits would be dull if they weren't SO tiny and ADORABLE. Yesterday I saw a yellow-rumped warbler working the sidewalk, in downtown Merced, with a bunch of house sparrows (i.e., gang members) and was shocked. Just a few miles away is a lovely national wildlife refuge, so what was this little guy doing pecking at gum? Yeesh. That's pretty freaky-deaky re: the hummers. Was it 2 males?